As more renewable sources are added to the electricity grid in Japan, the ratio of renewable sources to all electricity sources is increasing in prefectures and municipalities across the country. As of March 31, 2015, the number of cities, towns, and villages where the renewable electricity supply was estimated to exceed the electricity demand reached 100. The following is an update on the status and progress of renewable energy deployment in Japan, based on an article courtesy of Smart Japan, an online media services provider specializing in energy conservation. 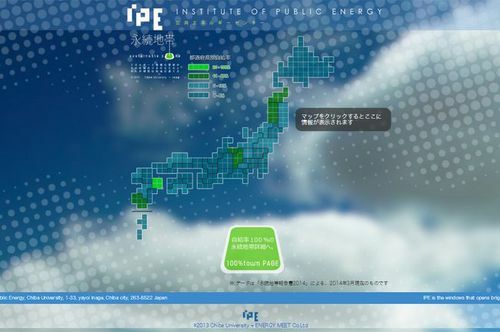 A group of researchers from Chiba University and the Institute for Sustainable Energy Policies (ISEP), a Japanese non-profit organization, has been conducting a joint research project called "Sustainable Zone Study" since 2007. The study measures the amount of renewable energy supplied and food produced by each municipality and, as a measure of local sustainability, calculates their self-sufficiency in energy and food, two resources essential to daily living.